Its almost more than week now from when massive protests and bloody clashes are taking place in different cities of Libya. 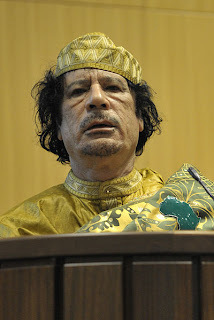 The Protesters are demanding Libyan Ruler Muammar Gaddafi to resign who is in rule from last 41 years. Muammar Gaddafi is not ready to resign and he has blamed foreign Intelligence agencies and Al Qaeda for protests in Libya. More than 1000 People have died in bloody clashes in different cities until now. Everyday many people are losing their lives and hundreds are getting injured. At Same time the youngest son of Muammar Gaddafi Saif al-Arab has also joined the protesters and demanded his father to resign. There are also media reports that Muammar Gaddafi may follow footsteps of Hitler of doing Suicide if things not remains under his control. Many Cities of Libya including second biggest city Benghazi are in control of Protesters.